Habit: Savia bahamensis grows as a shrub to small tree up to 5 meters in height. The leaves are arranged alternately, to 7 cm, elliptic to oblong/obovate with a rounded leaf apex and an entire margin. There are paired stipules at the petiole base. The actinomorphic flowers are dioecious. Staminate flowers occur in caulescent groups of 8 -14. The calyx has 5 unfused greenish sepals. The corolla has 5 small, unfused petals. There are 5 stamens and a nonfunctional ovary. The carpellate flowers are solitary in leaf axils. The calyx has 5 unfused greenish sepals. The corolla has 5 small, unfused petals. There are no stamens. The superior ovary has 3 locules and numerous seeds. The fruit is a 3 lobed capsule at maturity. The fruits may be tomentose. Based on this character the tomentose individuals can be considered S. erythroxyloides. Habitat: Savia bahamensis grows in Dry Broadleaf Evergreen Formation – Forest/ Woodland/Shrubland/Dwarf Shrubland (coppice, scrubland, dwarf shrubland). Distribution in Bahamas/Globally: Savia bahamensis occurs on all island groups in the Bahamian Archipelago as well as Florida and the Caribbean region. 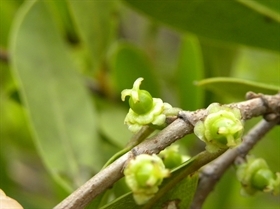 Medicinal/Cultural/Economic usage: Savia bahamensis is not used medicinally in the Bahamas. It is part of the horticultural industry.